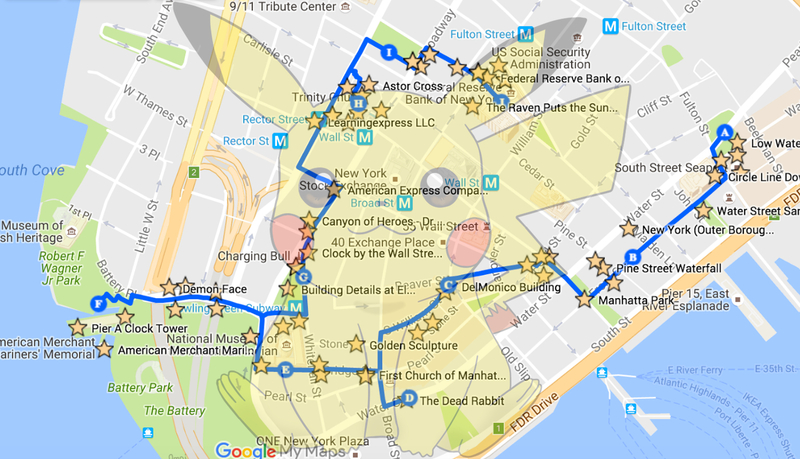 Inspired by three of our favorite things — history, the downtown area we call home, and our new obsession with Pokemon gaming, we decided to build a PokemonGo powered walking tour of our ‘hood. So Grab a bite to eat at some of our local haunts, catch some Pokemon and discover some history! Grab a bite from Smorgasbar in the Sea Port and spy the 60 ft-high lighthouse dedicated to those lost at the sinking of the “unsinkable” Titanic on April 15, 1912. As you walk past Wall Street Plaza, give us a wave. We’re on the 30th floor! The go-to place for client dinners [if you can find a seat! ], pop into the “World’s Best Bar” and head upstairs to the Parlour to peruse an incredible cocktail menu featuring 72 historically-accurate cocktails inspired by New York’s Irish-American history. Originally home to New York’s first native-born mayor Stephanus van Cortlandt , Fraunces Tavern is also known to be a meeting place for the Sons of Liberty secret society and said to have hosted George Washington before he addressed troops setting off to end the Revolutionary War. Opened in 1831 as a pastry shop, Delmonico’s went on to set the standard for fine dining across the country, offering à la carte options on a printed menus and also claims to be the first restaurant to offer a separate wine list. The building’s exterior is also rumored to hold marble columns salvaged from the ruins of Pompeii. If you have time, grab a slice of their famous Baked Alaska! A staff favorite for after work drinks, grab a beer and a table outside on the last surviving historic pier in the city. Completed in 1886 “to serve the New York City Department of Docks and Harbor Police”, Pier A offers an unbeatable view across the harbor, to Governor’s Island and the Statue of Liberty. Designed to showcase the power and wealth of one of the richest men on earth, the Standard Oil Building was the place John D. Rockefeller would build his American oil empire. As he entered the building, Rockefeller reportedly used to “tip his hat” to any protestors outside. Dwarfed by neighboring skyscrapers, Trinity Church’s spire was once the tallest building in New York. Stroll through the church graveyard to find the grave of the Founding Father of the United States, Alexander Hamilton. Step off the street and through a 35 ton door to grab a cocktail within the vault of a bank that’s lived through both world wars and the Depression. Grab a coffee at Blue Spoon and make your way down to 33 Liberty St. The New York Federal Reserve Bank is an imposing, fortress-like building, which is unsurprising as it reportedly holds the 3.76% of the world’s gold reserves. Pop around the block to 44 Maiden Lane and tour the vault to get up close and personal with floor-to-ceiling gold. The Downtown NY tour was curated by SS+K’s Claudia Cukrov, and Pokemon were enthusiastically captured by our intern Paul Malloy. You can also open it on your phone using Google Maps.